June 10th is National Rosé Day, but you probably already knew that because, well, it’s the most important day of the year! Whether you love rosé because it is THE drink of the summer, or you pretend to appreciate its “woody undertones” but actually just enjoy it because it’s PINK, you will probably want to celebrate this glorious day. Because good rosé can run pretty cheap, you might have extra savings to buy some rosé-themed accessories. Basically, the tagline for everyone’s favorite pink wine should be: Rosé, it’s not just a drink — it’s a lifestyle. If you have a rosé lover in your life who deserves a cute gift, or you just want to treat yo’ self, celebrate National Rosé Day with one of the items below! 1. “Stop and Smell the Rosé” doormat. No bar cart is complete without an adorable hand-painted doormat. This one’s available on Etsy for $48. 2. 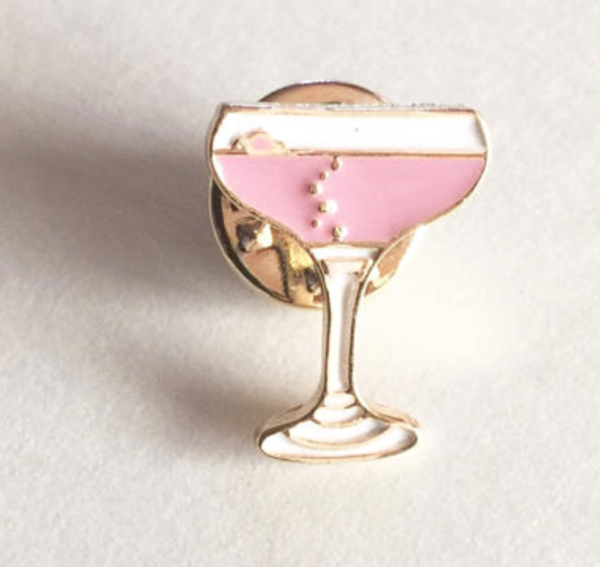 A rosé enamel pin. Wear your drink on your sleeve. This pin is only $6.99 on Etsy. 3. A “Rosé All Day” wine bag! This bag is only $13.00 on Etsy and it’s the perfect gift for your friend who doesn’t leave the house without a bottle of rosé. 4. Some on-brand wall decor. 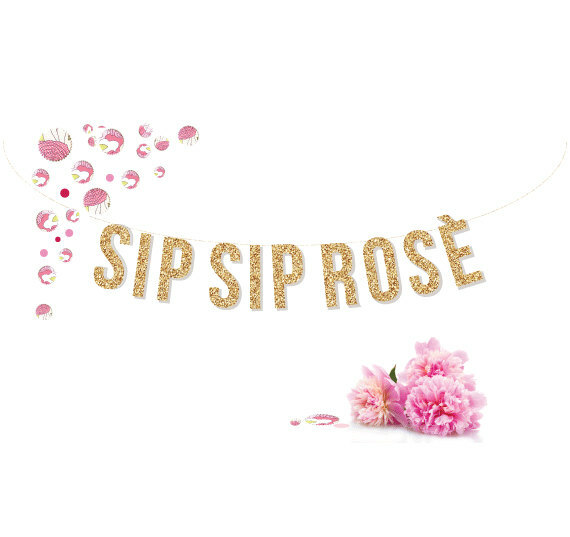 This “Sip Sip Rosé” gold garland will add a sparkle to your celebration. Find it on Etsy for $21. 5. Cards to send your rosé-loving friends (aka all your friends). What better way to show someone you car(e/d)? Find these on Etsy for $5. 6. “Slay All Day Then Rosé” embroidery that would make grandma proud. This would go perfectly on the wall right above a wine rack. Find this on Etsy for $46.11. 7. A rosé wine glass, of course! Because The Bachelor and rosé go together like bread and butter. This adorable glass is sold on Etsy for $15, and it’s the perfect rosé gift. Regardless of which rosé-themed gift you buy (or do not — hey if you want to save your pennies for another bottle, that’s great too), we hope you celebrate National Rosé Day like a queen. Happy sipping while bubble bathing.